This slow-speed submersible unit is available with integral IE3 Premium Efficiency motors ranging from 1.0 to 7.5 kW (7.4 to 10.1 hp) for gentle circulation and mixing of fluids in wastewater treatment plants and industrial applications. 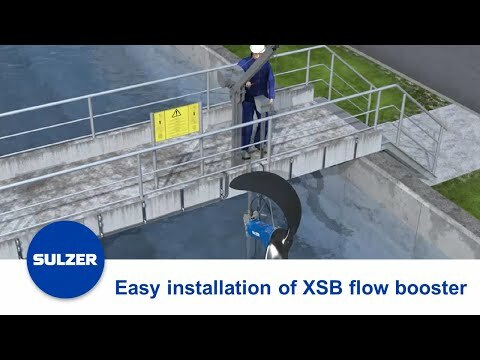 Propellers for the XSB are designed for easy transport and installation. Most models are mounted complete, while the larger 3-blade models have a special design that allows them to be attached blade-by-blade. This facilitates transport and eliminates the need for special tools. The unit is connected to a concrete pedestal by an innovative coupling system which allows the unit to be raised and lowered for inspection even in filled tanks. The pedestal absorbs all dangerous vibrations, thus giving a long service life both for the machine and the installation.